The defending national champion Wildcats are the top remaining undefeated team, but Gonzaga has the best chance of running the table. Last year was a lull for undefeated teams. After Wichita State (2014) and Kentucky (2015) finished their respective regular seasons unbeaten, no team entered the 2016 NCAA tournament with fewer than four losses. A little more than a month into the 2016–17 regular season, it’s time to check in on the remaining unblemished squads and predict when—or if—they may falter. Here are those six teams, presented in order of their ranking on kenpom.com. The defending national champions are favored in every remaining game, according to kenpom.com, but the Wildcats still only have a 1.0% shot at finishing the regular season perfect. Why? The biggest reason is that the Big East boasts some serious contenders. Conference foes Creighton (No. 17), Butler (19), Xavier (20), Marquette (38) and Seton Hall (44) are all in the top 50 in terms of adjusted efficiency, and Providence (51) and Georgetown (57) aren’t exactly lightweights. While it’s unlikely that the Wildcats can run the table, they should be the favorites to the win the Big East. Behind Player of the Year frontrunner Josh Hart, Villanova has the country’s No. 2 adjusted offense and No. 19 defense. The Wildcats have the kind of discipline that makes a champion: They rarely commit turnovers or fouls, they take smart shots and they force opponents to conform to their style of play. An undefeated regular season isn’t out of the question, but it shouldn’t be the loftiest goal this squad aspires to. The Bruins may not be the best team in college basketball this season, but they are without a doubt the most fun through the first 10 games. They’re No. 1 in the country in three-point percentage and two-point percentage; they’re No. 11 in possession length and No. 13 in tempo; and they’re led by a 6' 6" freshman point guard who’s in contention for the No. 1 pick in the 2017 NBA draft, Lonzo Ball. The Bruins have been remarkably balanced, too, with every one of the top eight rotation players boasting an offensive efficiency north of 105, and with six of them clearing 120 so far. After frosting cupcake opponents during their first five games, the Bruins have proved they’re contenders in their last five contests, beating Texas A&M on a neutral court, Kentucky in Rupp Arena and Michigan at home. But with two games apiece against Oregon, Arizona and LA-rival USC, UCLA is almost certain to slip up somewhere. Still, Bruins fans should savor every moment of this season—even in its losses, this team is bound to be entertaining. An unexpectedly strong backcourt is the secret of the Bears’ early success. Senior Ish Wainright has gone from a 2-to-1 assist-to-turnover ratio as a junior (his first season as a fulltime starter) to posting 34 assists against just six turnovers this season (a 5.7-to-1 ratio). And junior Manu Lecomte has been perhaps the best transfer in college basketball so far this season, jumping from 7.8 points and 2.0 assists per game in two seasons at Miami to 13.9 points and 5.3 assists in eight games this year. The Bears are perhaps the most balanced team on this list, with the No. 16 offense and No. 11 defense, in terms of adjusted efficiency. They play at a plodding pace (No. 332 in adjusted tempo), but have beaten their opponents by an average of 14.5 points. After winning the Battle 4 Atlantis by beating VCU, Michigan State and Louisville on consecutive days, they picked up a signature win at home last Saturday, dropping Xavier by 15 points. Still, even in what looks like a down year for the Big 12, Baylor will have to endure that conference’s brutal double round-robin schedule. The Bulldogs aren’t the best team on this list, but they do have the best shot at completing the perfect regular season—kenpom.com gives them a 4.0% chance. Of course, the reason for the bullish bet is that Gonzaga competes in the West Coast Conference. Its only serious conference threat is Saint Mary’s, which recently lost at home to UT-Arlington. BYU, typically another conference contender, lost at home by 13 points to Utah Valley on Nov. 26. All of which is to say that Gonzaga—which has already beaten Florida, Iowa State and Arizona on neutral floors—is more than capable of running the table. 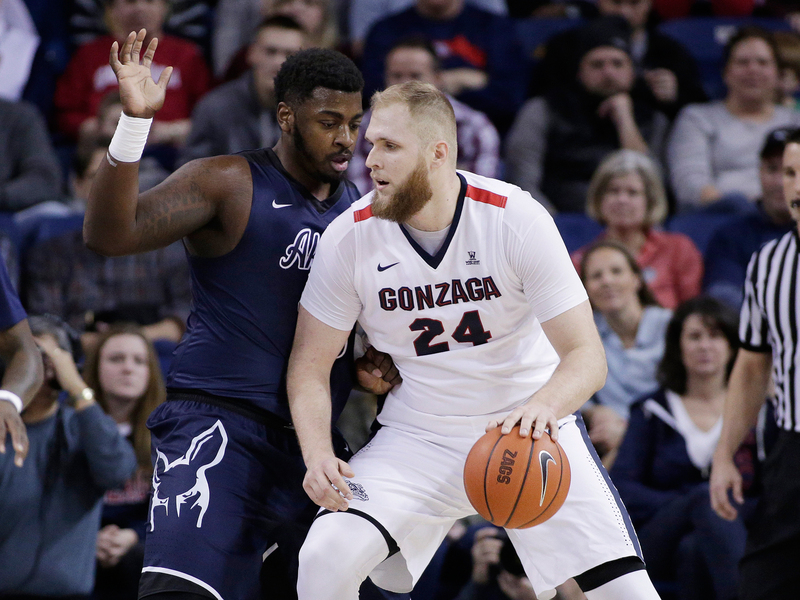 The Bulldogs have two ultra-efficient 7-footers in senior Przemek Karnowski (who is taking 30.8% of the team’s shots with an offensive rating of 117.5) and freshman Zach Collins (who is drawing 7.6 fouls per 40 minutes). A trio of transfers in Nigel Williams-Goss, Johnathan Williams and Jordan Mathews rounds out the roster and can help maintain the quality of basketball fans in the Pacific Northwest have grown accustomed to. The Bluejays are all about the backcourt. Marcus Foster (17.8), Khyri Thomas (13.3) and Mo Watson Jr. (13.1) are the team’s leading scorers and key playmakers. Watson, who uses 28.1% of the team’s possessions, is also a remarkable distributor, averaging 9.1 assists per game in the early going. Foster, who boasts effective field goal and true shooting percentages north of 60, is the team’s go-to scorer. And Thomas is the team’s top three-point threat, shooting 53.3% so far. Creighton’s biggest obstacle in the quest for an undefeated season is the same as Villanova’s: It competes in the Big East. And worse yet, it has to face the Wildcats twice. But this team is good enough to end the Bluejays’ two-year NCAA tournament drought, and good enough to make a run in March as well. It’s too soon to tell how good the Trojans are. And unfortunately, they don’t face another serious test until the end of the month, when they face their first Pac-12 weekend road trip, taking on Oregon State on Dec. 28 and Oregon on Dec. 30. USC does have some nice wins so far, but its best games were extremely close: It beat Texas A&M by two, SMU by five and BYU by seven. Every other game so far has come against a team in the bottom 200 of kenpom.com’s rankings.